I thought I posted this before but cannot find anything. Also the fact that I cannot search for 3 letter words hinders just a bit. (So this is for future searches: Keys, VIN Number, Keyring, Keys Code, Dealer Ring). Anyway, has anyone else have for their D, or seen one of these before? I recall something about this before, possibly on .com. I recall James knew something about them. Very cool item. Would love to find mine stuffed under a seat or something. I've never seen the large tag before. But I do have the smaller tab with the key code on my 83, and both original keys. I too got my 83 from the original owner. Never seen that before! Maybe made by Consolidated International when they had hundreds of cars on the lot? I have this for my car as well with both metal tags just like your picture. I keep mine in a safe place, as I assumed that they might be rare. I have this for my car, and it was a 1983 Consolidated vin, as well. It has a yellow paper tag, with the vin number, the larger metal plate with the last 5 of the VIN number, and two of the small rectangles which I assume are the key codes. That's the lighted key from the early style door locks. My car has that key as well. Yes, all 3 on the bottom row are lighted. In fact, when I bought the car 11 years ago one of the keys still lit up! 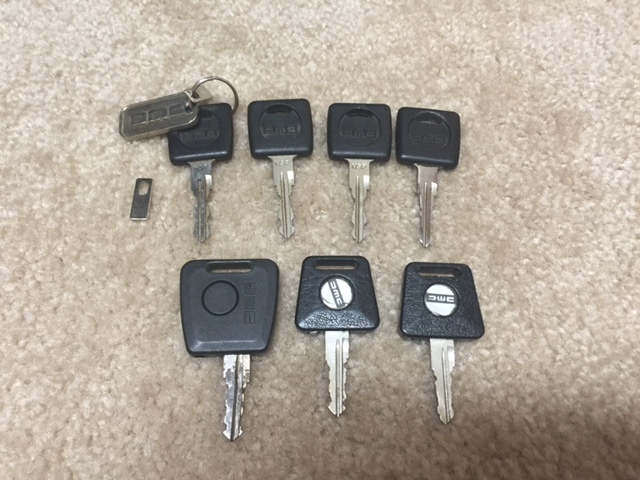 The big one on the far left I always thought was kind of unique, it's also a door key like the other 2 on the bottom.